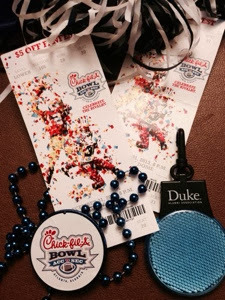 As a Duke alum, I've been pretty amazed and excited by their recent football success, and I was happy that the bowl was close enough to make an easy trip - New Year's Eve in Atlanta made it even better! We went to the alumni banquet before the bowl; the food and the company were good, (would have been more fun if Sam was there) and we got lots of free swag. The night before the bowl, we had tickets to the Old Crow Medicine Show here in Nashville at the Ryman Auditorium. We took off on the road after the show. About half way to Atlanta, we stopped at a Holiday Inn Express in rural Tennessee. Arriving after midnight, I was pretty tired and my main memory of the hotel is of extremely thin, cheap-feeling towels. The next day we continued on to Atlanta where we stayed at the Glenn, a cute boutique hotel next to the CNN/Omni and a block from the Georgia Dome. The Glenn had lots of memorable qualities, like little rocks in the hallway (? ), elevators that were key card controlled, patterned walls in the elevator, free bottled water, and lovely thick towels. I'm not sure the last time I replaced my bath towels, maybe two years ago, but at this point enough of the fuzz has rubbed off that they are not as nice as the Glenn's. For something we use every day, new towels are a small expense to result in so much pleasure. I determined to buy new towels as soon as Costco had white. I've been looking for a while, and my Costco has only had beige and colors for the past year. I was happy to see that Costco finally has white again. I paid $8.99 for each towel, and $11.79 for a set of two wash cloths, and 2 hand towels. These towels are long staple cotton, made in India. From research on the Internet, I believe long staple cotton is similar to Pima and Egyption. These towels are not Kirkland brand, but come with a Costco address on the packaging. I'm very happy with the quality, very substantial. If your towels are thinning, I recommend these. If you don't follow Duke, they lost the game, but it was so close and so much fun, we are glad we went.